I'm mildly obsessed with photographing migrating songbirds, especially warblers - it's my absolute favorite thing to do. Each spring I make an annual pilgrimage to photograph them at Point Pelee National Park, on the north shore of Lake Erie in Ontario. I spend long days out in the park, starting at the crack of dawn, carrying heavy gear around, hoping to find co-operative migrants that are in shooting range and will stop moving long enough to fire a couple frames. It's not unusual to go an entire day (or several) without getting one good shot! Warblers are the pinnacle of bird photography. It's both challenging and rewarding to capture photos of them. They're tiny forest gems, brightly colored in yellows, blues, deep oranges and reds. And they almost never stop moving! Successful warbler photographers have a rare blend of knowledge of bird behavior, exceptional camera handling skills and a hardy attitude that will not accept defeat! 'Keeper' warbler photos are the pride of any collection. In many years of shooting, I only have a small number which I revere! 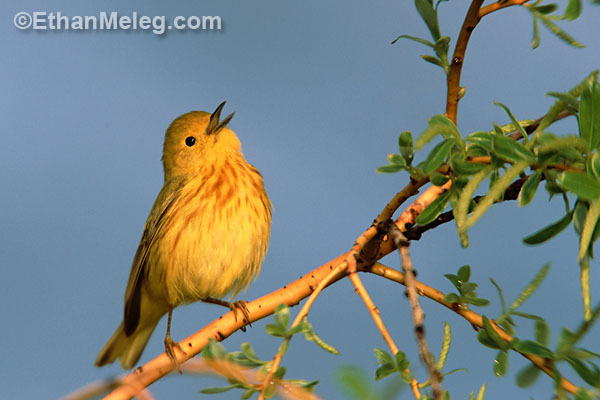 If you have a hunger to photograph warblers and other migrant songbirds, like I do, here are a few tips and suggestions to get you pointed in the right direction. Many songbird species migrate thousands of miles each year from their wintering grounds in the tropics, to spend the summer breeding season up north where there's plenty of habitat and food to eat (and they go back in the fall!). During migration, they regularly stop to rest and refuel, before continuing on their journey. At some famous 'migrant traps', large numbers of birds congregate, which of course attracts the bird photographers. Some of the best-known and predictable locations are High Island and South Padre Island (both on the Texas coast), Cape May (New Jersey), Magee Marsh (Ohio) and Point Pelee (Ontario). There are many other locations, but these are the biggies. Point Pelee is my favorite spot because I grew up there and know the park well. When the birds arrive in early May, the leaves are usually just starting to come out, which means clean shots at the birds. The best shooting is along the shorelines at the tip of the park, where the birds concentrate. Although the prime window of time is from May 10-20, migration is extremely dynamic and can vary greatly from day to day. It might take you many repeat visits to hit a day with a large wave of birds (or maybe you'll just get lucky!). On slow days, you can shoot the breeze with all the other die-hard bird photographers (including the world's top pros) lugging around their telephotos. 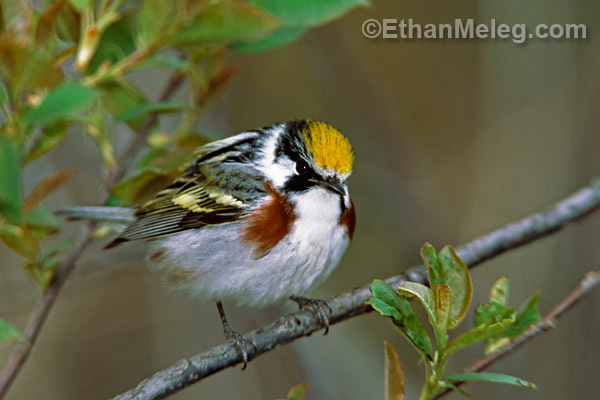 You don't have to be an ornithologist with a PhD to photograph warblers, but a solid general knowledge of bird identification and behavior will help immensely. Warblers are small, so just finding them requires practicing your birding skills. And there are about 50 species in North America, so identifying them can be a challenge. But you're greatest advantage for photography will be understanding how they move around and being able to interpret their body language. This way you can be in the right place at the right time, with your lens pointed in the right direction. It's much harder than it sounds! You'll develop this knowledge by spending lots of time trying to photograph them, and by watching experienced photographers. My best single piece of advice is to watch the general direction the bird is moving (while feeding in shrubs or foliage) and try to get ahead of it, so you're ready when it comes towards you. Lens choice, does size really matter? 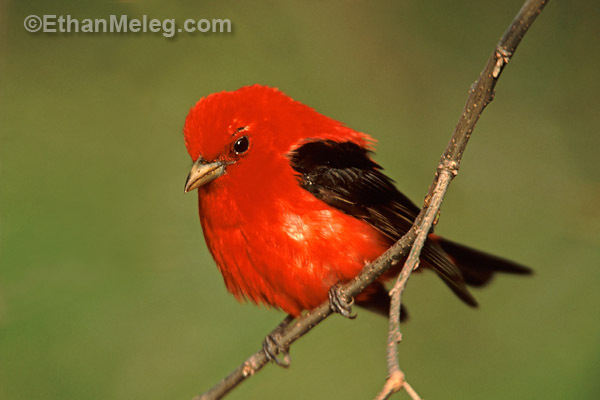 There are two camps in songbird photography - those who handhold or shoulder-stock a smaller telephoto lens (like a 300mm - 400mm) and the others who use a super-telephoto combo (500mm f/4 or 600mm f/4) on a tripod. Both have their advantages and disadvantages. The smaller setup allows for much greater mobility and closer focus. The big rig gives frame-filling magnification and out of focus backgrounds. I prefer the big rig setup, using a 600mm f/4, usually with a 1.4x teleconverter and 25mm extension tube (allows closer focus). It's expensive, awkward to use and painfully heavy, because you also need a monster tripod to support it. My back aches at the end of the day. But it works for me and I get results with it. Base your choice on what you can afford and what you can comfortably carry for hours at a time. Consider using a gimbal-style head like the Wimberley, which makes it way easier to manoeuvre a long lens. Improvements in modern autofocus (AF) camera bodies and lenses have made shooting small birds much easier, but it's still very difficult. I set my camera body for continuous AF (A1 Servo in Canon-speak) and pre-focus on the spot where I think the bird will be. This way, when the bird (hopefully) lands there and I engage autofocus, it snaps quickly to the bird without searching through the entire focus range. My personal preference is not to have AF set on the shutter release, instead I set it (through Custom Functions) to the * button on the back of the body, which I can engage with my thumb independently of the shutter button. This gives me much better control over when I autofocus, and prevents unwanted focus 'jumps'. I often only AF to acquire initial focus, and then fine-tune manually - that's when I'm lucky enough to have the bird stay in the frame! When following a moving bird, I'll keep continuous AF activated as I pan, if I can keep the bird reasonably in frame. Focusing on warblers and other migrant songbirds is extremely hard and most of the time I end up with blurry shots of a bird streaking through the frame, or with a blurred head turned away at the instant I fired the shutter. That's just the way it goes, even for the pros. It takes years of practice and persistence to get good at this game. In fact, it took me 5 years to get my first decent warbler photo. Keep at it, and the rewards will come in time! Have a great spring migration! Canon EOS 1N body, EF 600mm/f4 lens, 1.4x teleconverter, 25mm extension tube and 540EZ flash for fill (with a Better Beamer flash extender; flash mounted on a bracket higher above the lens). Wimberley head and Gitzo Tripod. Fuji Velvia 50 and Provia 100 films, usually pushed a stop.